What does one do if he doesn't feel like writing a long entry in his blog but he would like to put some content up? Usually I link to a news story that pisses me off or embed a Daily Show or Colbert Report clip. Today I'll try something different and utilize my massive Flickr archive. 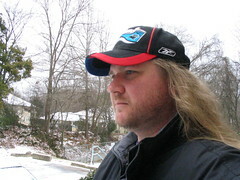 How about my long hair and beard from January 2005? I think it should be obvious why that is the last time I tried to grow a beard.